My first place in Mexico will always have a special place in my heart. Living in two countries is something I always thought you had to be fairly wealthy to do. The few people I knew who did it are quite well off. They maintain good-sized second homes in Mexico that they leave empty for months at a time. They didn’t worry about air fares. With time I learned that with a simpler, more minimalist lifestyle, I could lead basically the same expat life, one remarkably similar to theirs, for a fraction of their cost. In fact, I could make it cost less to live in two countries than living in one. As a "soltera" in Mexico (single women in Spanish, a single man being a soltero), it was particularly crucial to develop a streamlined, simple system if I was going to be going back and forth between Mexico and Denver. No one would be backing me up with, "You've got that passport, right?" Even with a small apartment in the States, there're plenty to do when you're orchestrating part-time expat life. Middle age is already a perfect time to simplify life. For most of us, life conditions have changed substantially (even though people don’t like to register that). A lot of articles aimed at my generation discuss how to decide what to give up, and whether you should. The trend is simplification even if for those who don't spend half their lives in another country. If you are divorced, maintaining all you maintained as a couple drastically cuts into the time you need to rebuild your life. I have seen divorced friends enslaved by the world they built as a married person. They are unable to let go of the familiar even though the work to maintain it has effectively doubled. Some keep huge houses after the children have long gone when the only reason they bought it in the first place was for the school system. A rich existence means your life, rather than lifestyle, should be complicated. Expect people important in your life to be complicated and make sure you don't spend every week-end cleaning out the roof gutters and running errands rather than engaging with them in their complexity. Numerous studies indicate people are happier when they invest in experiences rather than things. Eventually things, big houses, expensive cars, recreational toys, electronics, clothing and objects d’art have to be packed, cleaned, maintained, carried and worried over. Millennials have absorbed the lesson. Consumer goods manufacturers note with dismay their different buying patterns, their doing rather than having. Not that having things is bad, but whether you live in two countries or one, if you hear yourself saying no to spending time with the people you care about because you have to clean the garage, it’s time to take a look at whether you own your things or they own you. In our work lives we had to learn about prioritizing and discarding non-essential activities in order to be better at our jobs. We either learned how to be efficient or our bosses sent us to workshops and conferences that taught us how to be. One exercise I remember from one such productivity class is to take the tasks you have to do and give each task a 1,2 or 3 ranking. Then throw away the threes. You can apply that to possessions too. Nothing forces this issue of prioritizing and paring down to the ones and twos like living in two countries. When you have to put things into storage every time you go abroad, you see them differently. How many times do you want to pack and move that pair of roller-blades you haven't used in 15 years? (Another idea from a couple I know is to take pictures of what's in the box if the item triggers a sweet memory). For me, the most radical decision I made in order to live in two countries was getting rid of my car. If you live in a city with Lyft, Uber and maybe a little public transportation, you absolutely don’t want to worry about owning a car if you live most the year in another country. In addition to being chauffeured around by some really fascinating people, not having a car means I don’t have to worry about parking tickets, parking places downtown, car maintenance or having all the tags and permits. Not having a car has simplified my life substantially. Not only did I save a lot of money and simplify my life, participating in the sharing economy is more fun. Exploring it has made me feel part of a movement. These frequent exchanges with everyone from app developers to med students connect me to a larger (and younger) world. Having a smaller (but well-loved) place to live in the U.S. has given me the freedom to come and go to Mexico with only a few days preparation. Even worst case scenarios associated with renting my place out while I am in Mexico raise hardly a blip on the fret-o-meter. Security is not an issue like it would be leaving a larger home behind. The smaller my U.S. place, the lighter the weight around my neck. Remember that living in two countries doesn't mean you have to live like a refugee. I still come home to things I love. What I choose to leave behind in each country symbolizes which side of my personality dominates while I'm there. In Denver, I come home to a few pieces of art that have special meaning and my shearling coat. In Mexico, it’s a boogie board and a creme brulee torch. Different possessions, different worlds. Once you’re in Mexico, life is more simple because you desire less. You absorb a little bit more of a less materialist culture each passing day. You won’t realize just how relentlessly you are being sold to in America until you live in Mexico a while and then go back to the U.S. We have become completely numb to the bombardment. After even six months in Mexico, you will be hyper- sensitive by how incessant the sales messaging is when you come back home. You'll notice the constant marketing while on hold on the phone, when you're charged for add-ons, and when you are held hostage by a screen while pumping gas. "You can’t take it with you" certainly applies to being a part-time expat. In Mexico I use a little of the extra money I save by being more generous; treating people, hosting things, helping people out a little more Living in two countries has the potential to simplify your life, and through that simplicity enrich it, paring it down to what matters. A Tiny Life provides resources for tiny homes and simpler living. A songwriter who has basically written the soundtracks of our lives under the radar and keeps his life simple, the story of Max Martin by DiWeek-End - a great read on simplicity and art. Next up - Living in the so- called "tourist zones" don't mean you sacrifice the feeling of being in Mexico, especially since the tourists happen to be, uh, Mexican. Most recent post: Mexico may be the place to find your true purpose in life. 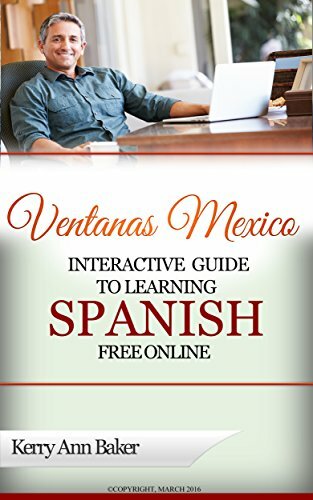 Hi, I'm Kerry Baker and a partner with Ventanas Mexico and the author of the "The Interactive Guide to Learning Spanish Free Online," and "If Only I Had a Place," for the aspiring expat renting in Mexico. Don't be an expat who doesn't speak any Spanish! Use the guide to link directly to the best tools and features on the web, the jewels that Google doesn't want you to know about. 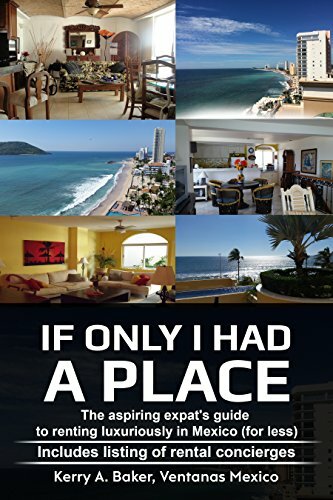 "If Only I Had a Place," is your guide for renting luxuriously for less in Mexico. More than a how-to book, it walks you through how where you rent determines your infrastructure as an expat. Book includes a listing of rental concierges.